Although Christmas may seem like it’s a long way away, it’s time to start thinking about exactly what you are going to do during those long festive evenings and Giggling Squid have got the perfect plans for you! 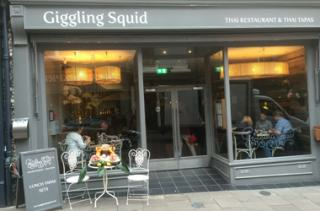 The delicious new Christmas menu from Giggling Squid is available from 24th Novembver-26th December. The menu is available for lunch and dinner (£18.95 lunch, £24.95 or £29.95 for dinner) and includes tapas sets such as ‘The Festive Squid’, a sensational mix of Tom Kha Chicken Soup, Duck Spring Rolls, Pork Belly Thai Style and Jasmine Rice. For dinner, you can expect the classic Grilled Chicken Satay, Thai Green Curry and Tropical Jungle Curry which will definitely leave you reaching for that glass of bubbles as it certainly packs a punch!